One Man's Lonely Adventures In His R33 Skyline GT-R: Öhlins DFV Rebuild (Part 2) and Factory Tour! Note: The following began as a post for another site. Unfortunately, that fell through. So, please enjoy this "exclusive" post, which I've modified and added to provide more detail than what would have ended up on the other site. 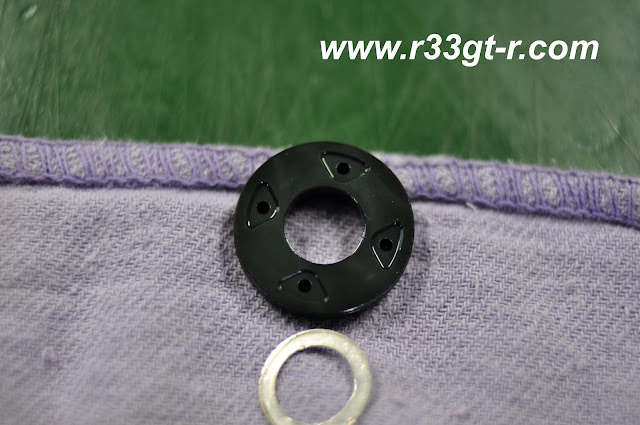 Soon after I bought my BCNR33, seeking a more sporty ride and wedded to the idea of “close to OEM as possible,” I replaced the OEM (“GT-R” labeled!) shocks with Nismo’s street focused, steel bodied S-Tune shock absorbers, which looked great and had a slightly firmer, sportier ride. After a few years however, I found performance on the track to be a bit lacking. At the same time, I began reading about rebuildable, customizable “proper coilovers” and then found that Öhlins had come out with their aluminum bodied “DFV” coilovers (incorporating their Dual Flow Valve system) for the BCNR33 and BNR34. Developed by Öhlins AB in Sweden, the DFV technology uses two sub-valves, one on the compression side and the other on the rebound side, to supplement the main piston. These valves allow for high speed (not car velocity, but how quickly the dampers react to the road surface) damping, while the main piston handles low speed damping. 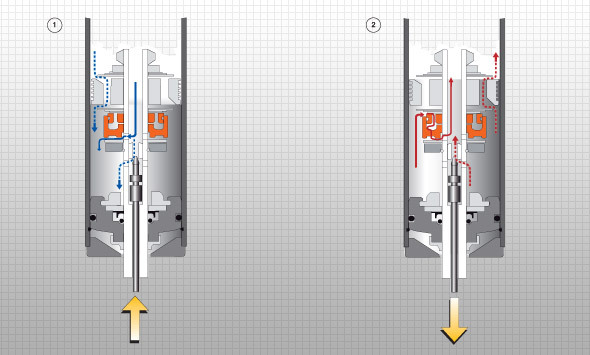 This means, while maintaining the characteristics of the main piston (which can be paired with a fairly stiff spring, as is often the case for cars that might see the track), DFV equipped dampers respond almost immediately to minor road imperfections, thus maximizing tire traction while giving a smooth, compliant ride. Despite the DFV coilovers being relatively new to the market back then, I managed to find and buy a used set online for a great price. The seller claimed he had bought them new and then used them for a few thousand kilometers before switching back to something softer, only then to have his car stolen! 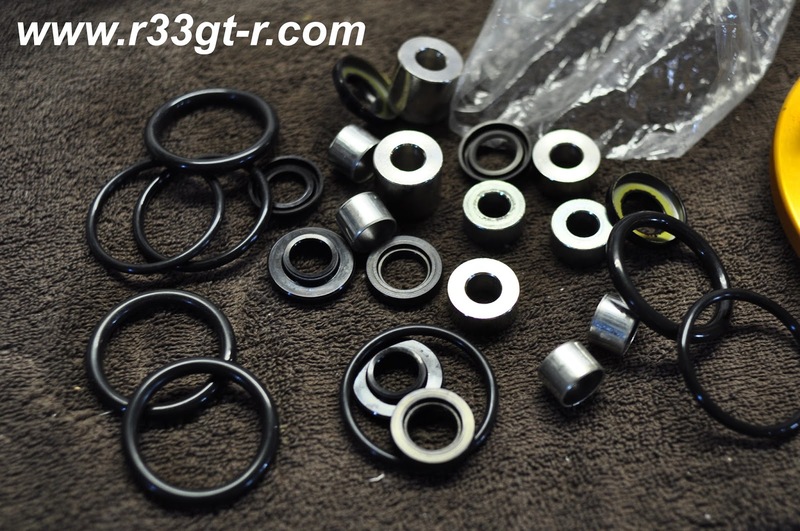 Thus, he was divesting himself of all of his leftover GT-R parts. Anyway, once installed they were indeed like new, and I immediately noticed the difference between the S-Tunes, with the ride being much firmer, but also, and quite paradoxically, extremely smooth. Flash forward six years and several thousand kilometers later, the ride had gotten progressively worse, but I didn’t really think anything was off until on a recent journey to the back roads of Chiba Prefecture with Mr. Dalle Carbonare, when we both agreed that something seemed off, that the suspension seemed to not have enough rebound. 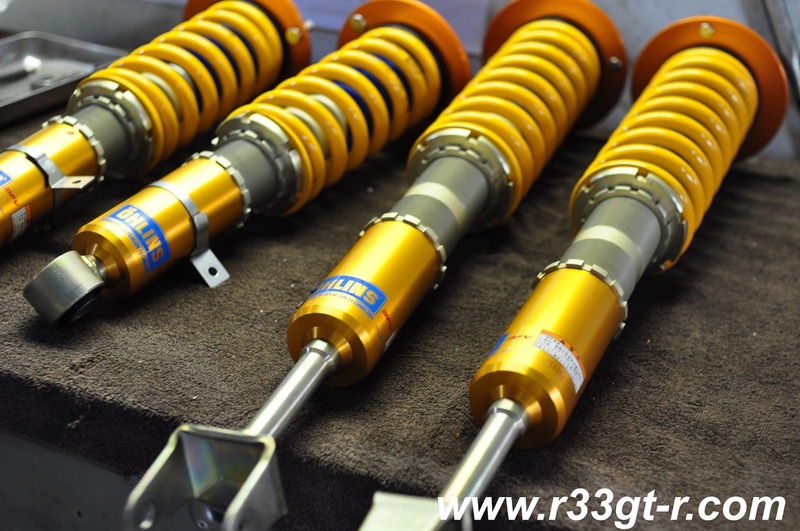 It was a reminder that my gold DFV coilovers were long overdue for a rebuild. Looks great, but the ride was actually not as good as it should have been. As I don’t have the garage space to do a coilover removal and reinstall, I asked Ninomiya-san (my neighborhood mechanic) to do the work at his shop, “BeAmbitious.” Once removed, the actual rebuild would take place at Öhlins’ authorized Japanese manufacturer and distributor, Labo Carrozzeria in Adachi Ward, Tokyo. Turns out, as an ex-NISMO race team mechanic, Ninomiya-san has plenty of contacts in the industry, and so knowing I wanted to see how a rebuild was done, he called Labo Carrozzeria and arranged for me to visit them for a private tour of their operations. Outside Labo Carrozzeria, where Öhlins are built and serviced. Upon my arrival, I was greeted by Hiroshi Shitakubo, Group Leader for the Sales Department. After exchanging pleasantries (turns out we know people in common in the car world here! ), he gave me a short history lesson on Öhlins AB and how they had begun in Sweden making shocks for 2 wheeled vehicles. He also discussed their current product line-up, including their racing, rally and offroad, and Build To Order (BTO) applications, their JDM-only models, and of course their DFV coilovers, now silver in color (due to environmental concerns) and sold worldwide as their “Road & Track” models. Shitakubo-san then invited me to tour the factory/workshop floor with him. 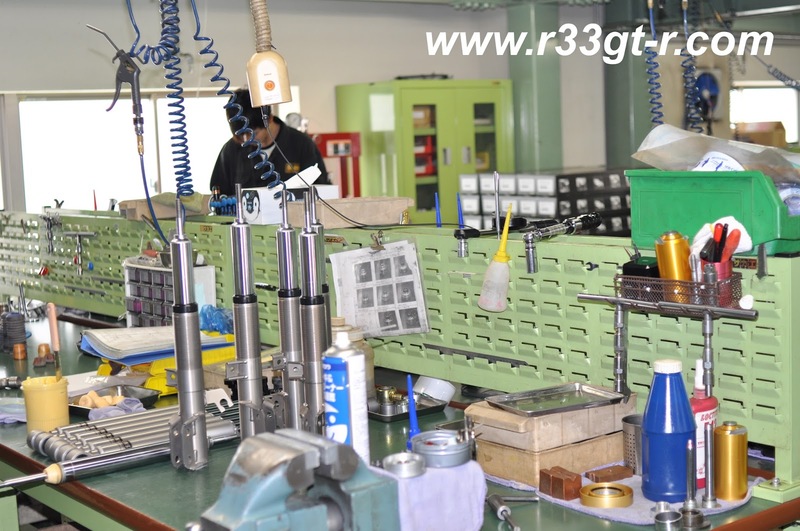 On entry, he pointed out that most the workstations are dedicated to the automotive line-up, with the motorcycle section in a segregated space in back. Unfortunately, it turned out that they had already finished rebuilding my DFV coilovers so I wasn’t able to watch them do that. However, I was able to witness various coilovers at different stages of overhaul, as well as new Road & Track sets being built. 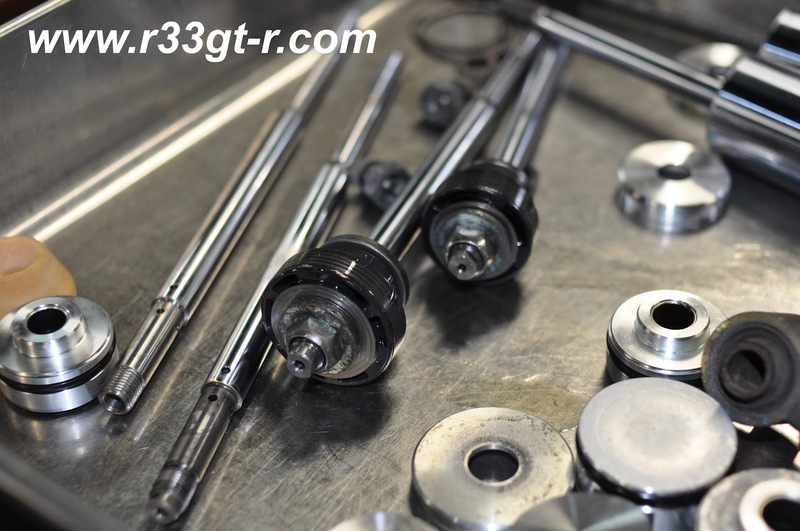 For rebuilds, all the incoming coilovers are thoroughly cleaned, inspected and then disassembled. 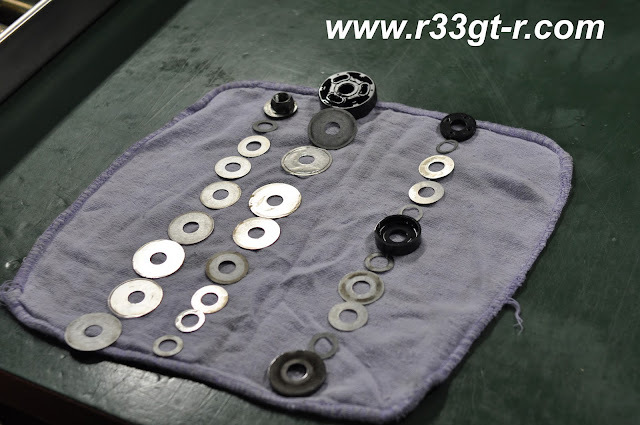 Certain parts are always replaced, whether or not the wear is obvious or not. 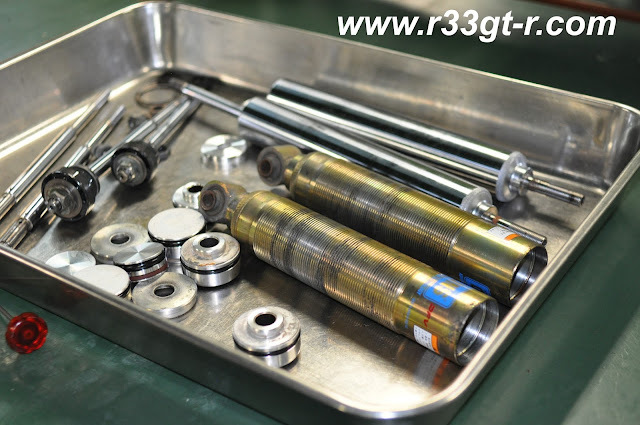 Those parts include the various internal seals, and of course the oil. 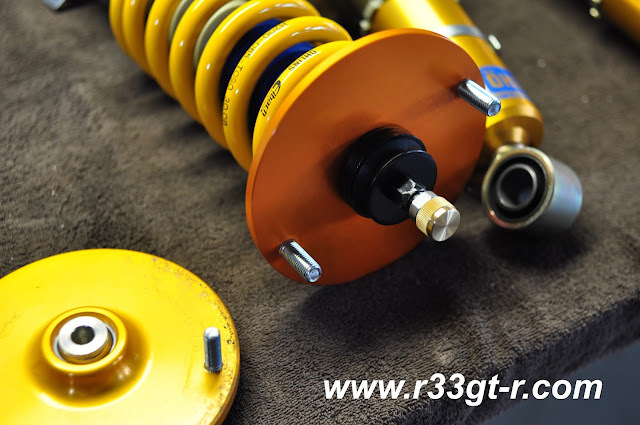 The coilovers are then reassembled to the customer’s order, which might include changed springs and compression/rebound rates, as well as the addition of optional features. 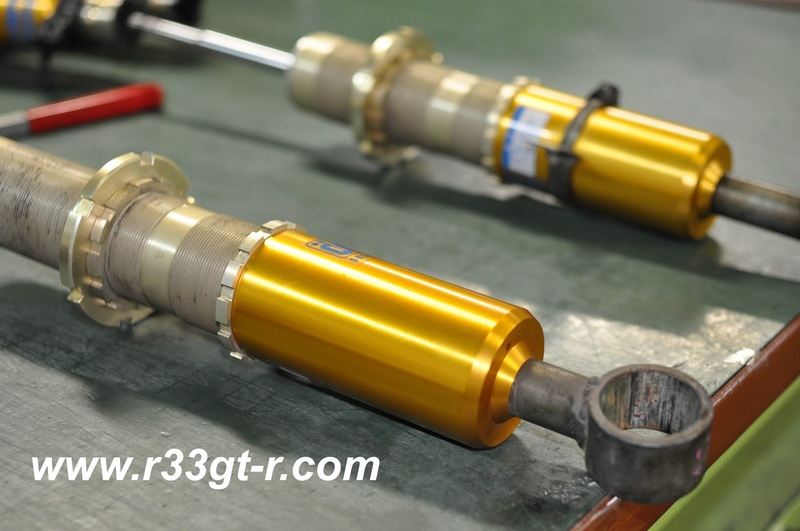 Finally the coilover undergoes several QC checks before being shipped back to the customer. In my case, as you can see below, I chose to swap out the standard pillow ball mounts with rubber mounts, but kept everything else standard to the recommended Öhlin spec. And a close-up of new Road & Tracks ready to get shipped out. So they no longer make the gold ones... hold onto them as collectibles! When my schedule finally cleared up a few weeks later, I dropped into BeAmbitious where I had the pleasure of removing my rebuilt DFV coilovers from their protective bubble wrap packaging. I tore off that bubble wrap in no time!! Then starting drooling. Interestingly, Labo Carrozzeria also sends back all the used parts, mainly to give picky owners peace of mind that they did the rebuild. Old solid mount on left, coilover now hos the rubber mount. This photo also reminded me that the set-up uses Eibach springs too... quality throughout! Once re-installed on my GT-R, I could not believe how amazing the ride was. The ride was extremely smooth, quiet and comfortable but at the same time firm and stable, with no weird body movements, whether at low or high speed. The entire car feels very tight, but without any harshness. Loss of feel due to the rubber mounts? None that I could detect, really! 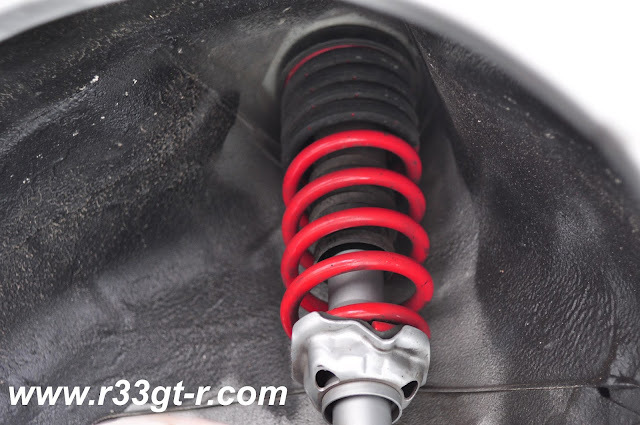 Given that Öhlins markets the Road & Track series as improvements to the OEM suspensions on high performance German cars, I think that gives you an idea of the kind of performance I am trying to describe. If you do a search on the web, I see so many comparisons between the DFVs and other very famous brands, and almost always the verdict is in favor of the DFVs. So I'm happy I stumbled onto them. Oh, and now, after having driven the GT-R with these rebuilt, I know why Öhlins recommends a rebuild every 2 years or 20,000 kms. 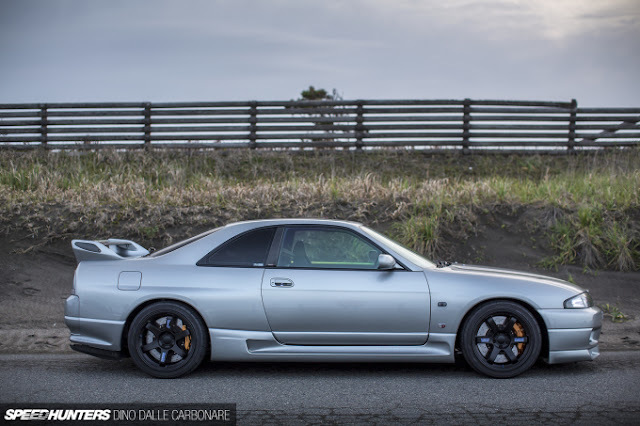 "Anyway, now with these as-new DFV coilovers, along the stiffened chassis and NISMO suspension links, I’m pretty happy with the handling characteristics of the car. However, I’m not done yet as I have several projects in mind, all aimed at seeking further refinement on various aspects of the car, and not just in the handling department. Thanks for reading this and next time I hope to showcase one of those refinements." And so with the quote above, I ended the original post... but it turned out that Ninomiya-san had spotted something odd on the car when he was doing the reinstall... stay tuned and I will post an update on that! When i bought my GT-R it was some very old Öhlins on the car installed from Japan. Wanted to rebuild them to like you so i went to Öhlins here in Sweden, but they could'nt rebuild them as they were from Japan. Their "Swedish/European parts wasnt the same as the parts from Japan. So unfortunately i had to let them go. Bought the Cusco Zero 2E instead. Always wanted the Öhlins though. Thank you for the comment! Well, the very old Öhlins were probably not worth rebuilding anyway... How do you like your Cuscos? great post Aki. I guess thats why Ohlins are expensive as you get the after care also. I was out on track last week with my Nismo S-Tunes on my GTST. nice setup but as you say it could better. No, i guess they were as old as everything else on the car when i bought it. Öhlins, Recaro SRD seat, HKS EVC 4, Volk GR-Cs and a HKS 4" titanium muffler exhaust (which i've never seen on any other Skyline, just one Supra). I like the Cuscos. A bit hard for road use though. Thanks! Well actually you can order parts to rebuild the S-Tunes as well, I am thinking about it since the parts alone aren't that expensive and as I learned by trying to roll around on dead S-Tunes,it's nice to have a spare set lying around. 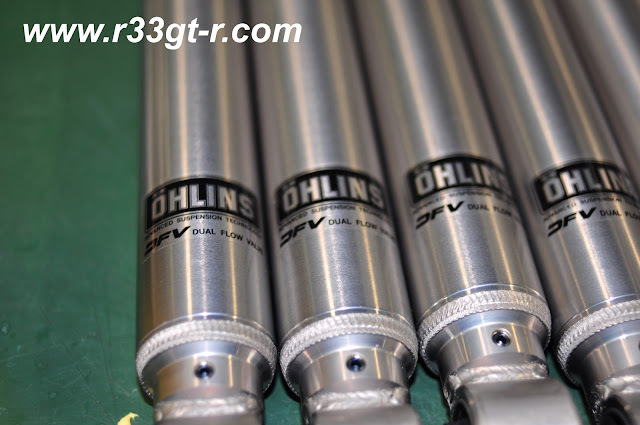 I think the Ohlins are expensive due to their use of aluminum bodies, plus of course their patented DFV which no one else can copy at the moment. Johnny - got quite a collection of interesting parts there....especially that HKS muffler, I've never heard of such a thing! Got a set of Overtech coilovers, not too harsh 10kg/8kg. Took me around 60 minutes on google to find the brand, never heard of them before. Seem to be a small company from Saitama. I have been an avid reader of this blog for almost two years. Last year i just got myself my very own gtr. 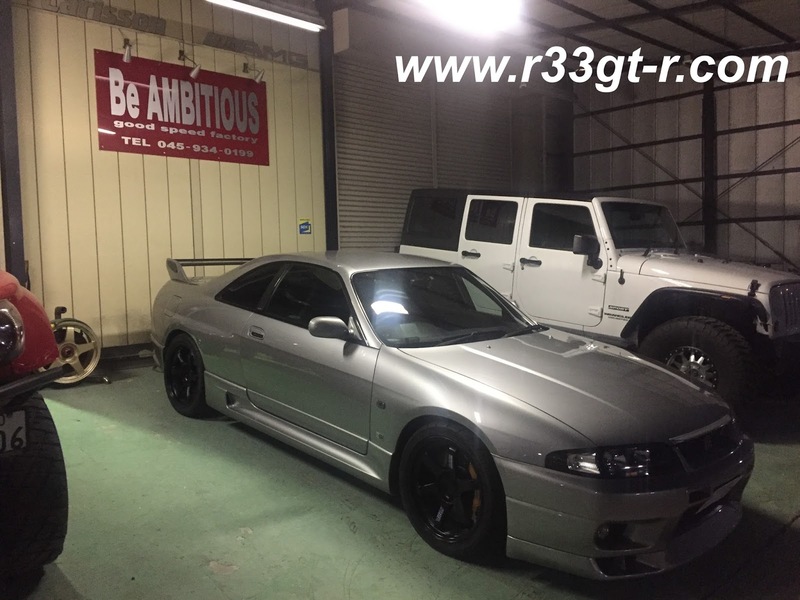 Its an r33 gtr vspec gunmetal. And this year i plan to do an overall restoration on it. I have done all the maintanace stuff. But now i have a problem. Whenever i am at constant speed ie 120kph the hicas light sudenly invades my cluster. Can anyone help me? Many thanks for the kind words. The best way for you is to join the invite only club I've set up on Facebook - it's a resource for 33 GTR owners where we can discuss all things 33 without distraction - whether it be other cars or other topics. Please find me on Facebook under my name (Aki Itoh) and I will send you an invite, or you can risk leaving your email here and I can email you an invite as well. Good luck and congrats on your car, by the way! Welcome to the 33 world.